Piercing your lower lip and flaunting a piece of shimmering jewelry in it is a cool thing to do. But you do have to contend with the fear of infection almost every day. 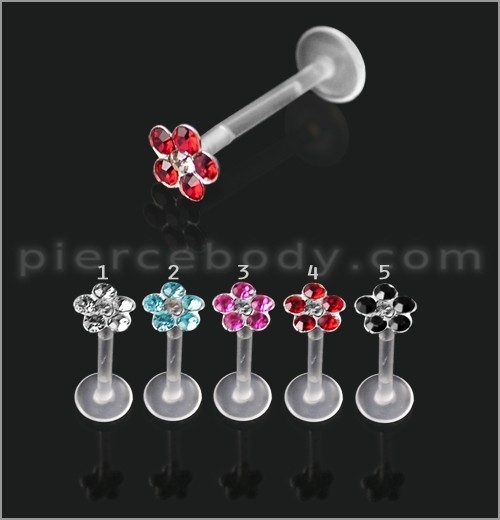 It makes sense to go for a bio flex labret piercing that helps you to stay irritation free. It would also look exotic at the same time. Why Do You Need a Bio Flex Labret? Bio Flex Labrets are basically used for a lip piercing. It provides ease and comfort with plastic push-ups and pin-ups. It comes in different colors and shapes like heart, flowers, crown, etc. These Labrets are also used as nose loops. At times, its diameter is very small and also easy to wear. The ends are not in the shape of balls always though and can excite you with cones, spikes, and other funky shapes that will draw attention to your lower lip and its minuscule piercing from afar. Take your pick from red, green, blue, and yellow along with hundreds of colors both common and rare. You are free to go for a multicolored one too as you are entitled to take up an UV anodized labret that gives you an eerie look by glowing steadily in the dark. This website features unique bio flex designs, which are made from good material and are not heavy and bulky at the same time. Lip piercing is very delicate, so these labrets with bio flex designs are made with some due considerations on the safe side of the skin. They are available at affordable prices in vibrant design options. Piercing your lower lip and flaunting a piece of shimmering jewelry in it is a cool thing to do. But you do have to contend with the fear of infection almost every day. That is why it makes sense to go for a bio flex labret that helps you to stay irritation free and look exotic at the same time. You do not have to stick to a handful designs only though. Try out the Piercebody.com website and you are bound to find a huge collection that is in sync with your style sense. You are welcome to don an interesting logo on your lower lip too.